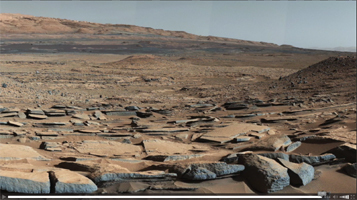 A view from the "Kimberley" formation on Mars taken by NASA's Curiosity rover. The strata in the foreground dip towards the base of Mount Sharp, indicating flow of water toward a basin that existed before the larger bulk of the mountain formed. The colors are adjusted so that rocks look approximately as they would if they were on Earth, to help geologists interpret the rocks. This "white balancing" to adjust for the lighting on Mars overly compensates for the absence of blue on Mars, making the sky appear light blue and sometimes giving dark, black rocks a blue cast. This image was taken by the Mast Camera (Mastcam) on Curiosity on the 580th Martian day, or sol, of the mission. Malin Space Science Systems, San Diego, built and operates Curiosity's Mastcam. NASA's Jet Propulsion Laboratory, a division of the California Institute of Technology, Pasadena, built the rover and manages the project for NASA's Science Mission Directorate, Washington.